The cylinder machining at Tees Components Ltd. is moving towards completion. 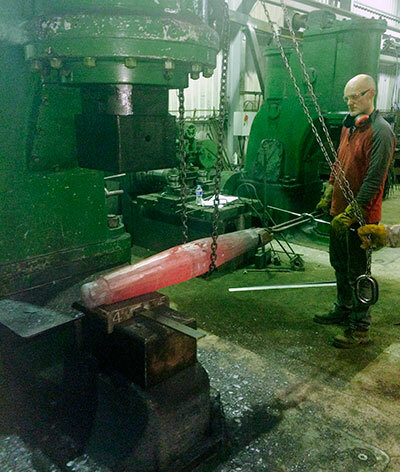 In Manchester Stephenson Engineering have commenced manufacturing the brake shaft. The photo shows the shaft being forged. This will be followed by forging the arms with forked ends and welding them to the shaft. 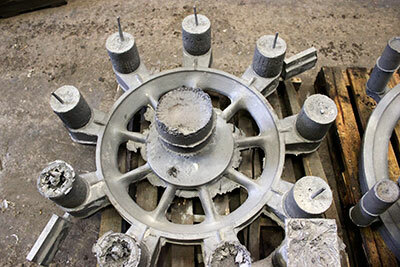 The pony truck wheels have been cast at The Boro’ Foundry Ltd. and will be machined preparatory to moving to South Devon Railway Engineering for fitting of tyres and axles. Pattern making for the front pony truck framework is underway at Boss Patterns in Coventry whilst the Standard class 2 project at the Bluebell Railway are looking after the pattern making for the rear pony truck framework. At Bridgnorth now that we have a set of new coil springs the buffers are being assembled and fitted. The axleboxes have finally vacated the slotting machine so now it is the turn of the crown brasses before they can be fitted to the axleboxes. Machining of the keeps continues. Machining of the adjustment links for the main driving wheel springs continues. Look out for forthcoming articles in Steam Railway (January) and Steam Days (March). Steam Railway is, we hope, going to publish a piece about well-known SVR (and ELR) driver and Trust member Frank Cronin’s attempt to buy 82034 from store at Patricroft in the late 1960’s; while Steam Days is featuring a full-length article by member Alan Clothier, who worked in the Swindon Design Office beween 1949 and 1953 and was responsible for some of the design features of the 82XXX class. Among these were the angled spectacle plate glasses in the cab, which effectively cut down the problem of reflected glare from the fire when the engines were working at night. Both magazines will contain a boiler appeal insert leaflet of a new design. At least as far as the colour scheme goes, this departs quite radically from the green theme of previous leaflets. A printer’s proof is seen here - hope you like it. And don’t worry, our printer has been alerted to the “typo” in the second paragraph! Keep your fingers crossed that the leaflet will do its job and bring in a decent amount of support for 82045’s boiler. 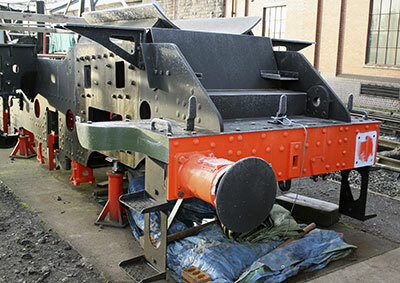 At the time of writing, the Boiler Appeal had passed £133,000 - not bad since March - virtually half way to our target and meaning that it should perhaps now be renamed the Firebox Appeal, since the boiler itself is accounted for. Thank you so much to all of you who have contributed up to now to bring about this fantastic result: we have more than held our own in the face of fierce competition in the hobby press for new build project funding. Meanwhile, artist Stephen Millership has virtually completed a lovely poster for display on the SVR and sale to the public by the Trust. Entitled Raising the Standard - an inspired suggestion from member Iain Jack which works on several levels at once and is so much better than anything I came up with myself - the scene features 82045 crossing Oldbury Viaduct at the head of a rake of blood and custard carriages, bound for Kidderminster and with the distinctive skyline of Bridgnorth in the background. The poster will be featured in the December updates and will be on sale from Barbara in the New Year, and we hope that it will raise our profile still more on the SVR. One of our members, Tony Cousins, has offered to develop an archive of recorded sightings, photographs etc of any member of the 82XXX class anywhere on the BR network. If you have old records, photos or a personal library containing published pictures of an 82XXX in BR days, please drop a line to Tony giving as much information as possible i.e. number, date, location, duty, source of information and name of photographer either by email to anthony.cousins@virgin.net or by email to 26 Hillfield Road, Bilton, Rugby CV22 7EW. Tony’s own research has already pulled up the odd gem such as 82026 double heading 76049 on a Blackpool-Newcastle passenger train in September 1956. Can you add to that? The forged brake shaft. Photo: Robert Stephenson. First re-assembled buffer fitted on 24th November. Photo: Tony Massau. All Aboard The Eardington Explorer! A small group of working members - Bryan Clarke, John Gupwell and Gareth Price, with the help of Steve Downs (Eardington Station Master) - is hard at work planning a special fund-raising train which is to run on Friday 17th April. Called The Eardington Explorer, the train will consist of three GWR Toplight coaches hauled by Collett 0-4-2 tank 1450. Departing Bridgnorth at 11.00 a.m. it will head for Hampton Loade, where the engine will run round its train after a photographic run-past, then set off back to Bridgnorth via the SVR’s “hidden gem”, the rarely-seen Eardington Station. Here we will make a protracted stop of up to two hours for a variety of nice “jollies”, including refreshments and a talk by Steve Downs on the interesting history of the station, which is, oddly enough, the only one on the Railway that was actually built by the Great Western Railway. There will be a bar on the train for those who enjoy the odd tincture, as well as a raffle to win £100 for a fiver and one to win the train nameboard, which is to be made to traditional design by the SVR’s Colin Astbury of the C&W Dept at Bewdley. Footplate rides will, subject to the SVR’s approval, be on offer at a cost still to be decided. As well as being a fund-raiser for 82045, the Eardington Explorer is running fifty years since the first train stopped at the preservation-era station in 1965, and for this reason tickets are priced at £19-65. Cheques (made out to The 82045 Steam Locomotive Trust) or cash (we can give you your change on the day! ), should be sent to Bryan Clarke, Oak Tree House, 10A Love Lane, Bridgnorth WV16 4HD. Please write your name and address on the rear of your cheque or send it with the cash. A programme of the day’s events will be sent out to you, with a souvenir Edmondson ticket, towards the end of February. Keeping the event in the family, 1450 will be crewed by Tony Massau (driver) and Chris Proudfoot (fireman) and will be parked in Eardington platform throughout our stay there. Passengers are welcome to come and visit the footplate of this smart little engine - let’s just hope we have reasonably good weather so that no one is tempted to do so just for a warm! All profits will go to the 82045 Boiler Fund, and we hope for a good turn-out for what promises to be a very pleasant, and unusual, day out.